For additions ≤ 300 ft² cool roof compliance is not required. No requirement for a whole house fan (WHF) to provide ventilation cooling. If the addition has a floor area > 700 ft² and < 1,000 ft², all requirements of Package A apply except the West-Facing Glazing Area may allow up to 70 ft² for additions up to 1,400 ft² (since 70 ft² is 5% of 1,400 ft²). See §150.2(a)1A. Removed wall and window not included in the calculation. Additions of 300 ft² or less are exempted for the cool roof requirement. 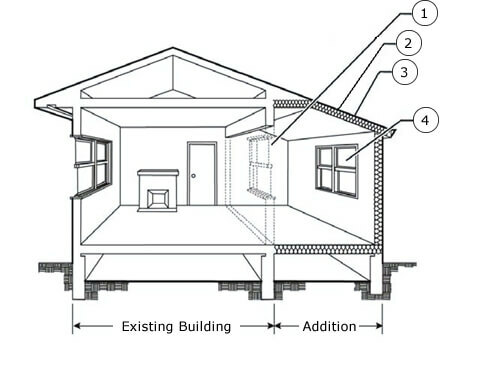 Insulation requirements from Package A; unless addition is 700 ft² or less, then R-13 for 2x4 walls and R-19 for 2x6 or greater walls is acceptable for wood frame. For additions < 400 ft²: 75 ft² or 30% of CFA — whichever is greater — for total glazing area; and 60 ft² for west-facing glazing. For additions > 400 ft² and < 700 ft²: 120 ft² or 25% of CFA —	whichever is greater — for total glazing area; and 60 ft² for west-facing glazing. For additions > 700 ft²: 175 ft² or 20% of CFA — whichever is greater — for total glazing area; and 70 ft² or 5% of CFA — whichever is greater — for west-facing glazing. Every section above states that the addition must first meet the Prescriptive Measures of Compliance. Prescriptive measures are required energy features for the project and vary by climate zone. For further information on the Climate Zone specific Prescriptive Measures, contact us.